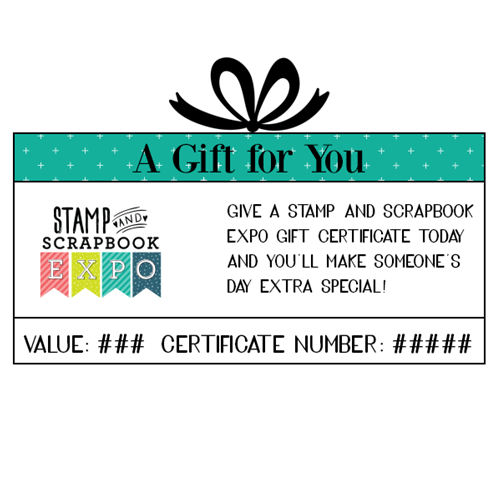 Put a smile on someone's face with a Stamp & Scrapbook Expo E-Gift certificate! Our gift certificates are the ideal way to go! A printable e-gift certificate will be sent to you instantly upon completion of your order. It's the perfect way to get a gift in only minutes. There is a $1.00 processing fee. May be used at any Scrapbook Expo event or online. Available in the value of your choice (minimum $25). Use towards admission, workshops, crop tickets or Scrapbook Expo merchandise. Not valid at vendor booths.